At the White House Correspondents Dinner this weekend, President Obama made a joke about ex-Rep. Michele Bachmann’s repeated refrain that he is bringing about the Last Days, and the former Minnesota congresswoman is not pleased. 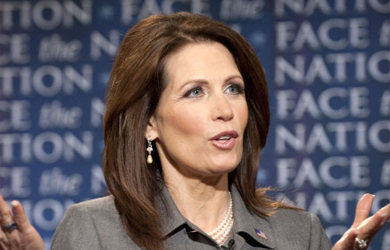 She and other Religious Right pundits told the End Times outlet WorldNetDaily that the president’s joke was an act of anti-Christian persecution and suggested that people who disagree with Bachmann’s remarks are really denouncing all of Christianity. “The Bible is filled with exciting information about living life today and in the future, both in this life and in the life to come,” Bachmann told WND. “Any message that brings people closer to God’s wonderful plans for our lives is a good thing. “To see her hammered and trashed by the left, and even some on the right such as ‘The Christian Post,’ is very grievous,” said Markell, co-author of “Trapped In Hitler’s Hell” with Holocaust survivor Anita Dittman, which has also been made into a film. But two solid weeks of trash talking has accomplished more to get Bachmann’s message out than any single interview on a Christian radio station ever could, Markell said. Joseph Farah, WND founder, chief editor and CEO, believes Obama’s mocking of Bachmann is just the latest example of his disdain for anyone who actually believes what he reads in the Bible and is willing to discuss it publicly. “Michele Bachmann, like me, was profoundly impacted by the stunning revelations of the New York Times-bestseller ‘The Harbinger’ by Jonathan Cahn about the way America has been inadvertently re-enacting an ancient script written and played out during the fall of Israel,” Farah said. “To Obama and most other non-Christians, this is just silly superstitious stuff – the kind of thing you make jokes about for cheap laughs at the White House Correspondents Dinner. But remember who the cheap laughs come from – people who look at what Obama has done over the last six years and see success, progress, achievement, prosperity, wisdom. If that’s what you see in Obama’s America, then you will surely think it’s funny that the nation is threatened by God’s judgment for disobedience and turning from His ways. “Time will tell who is right – and I don’t think it will be a long time before we know,” Farah added.